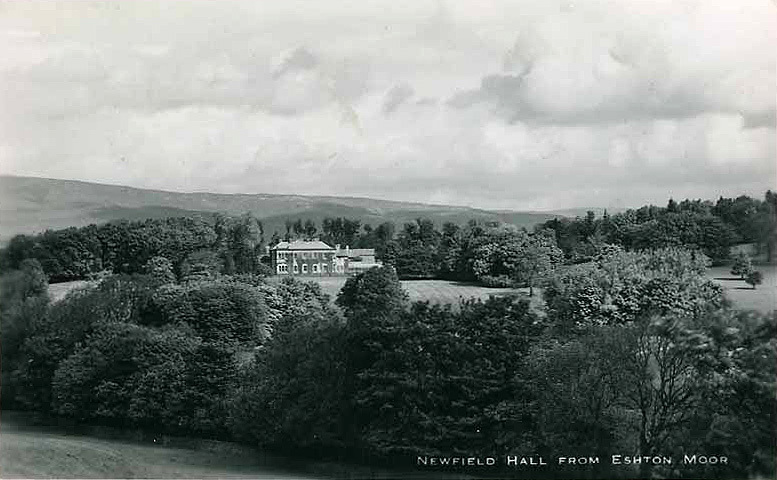 Before Newfield Hall was built, the land belonged to the Lambert estate. On the death of the last male Lambert heir in 1702, the Lambert estates passed to Sir John Middleton of Belsay Castle, Northumberland, who had married the Lambert daughter and heiress Frances, at Kirkby Malham in 1699. Morkill goes on to inform us that their son Sir William Middleton sold the Malhamdale property in 1727 to Oliver Marton, of Gray's Inn and of Capernwray in Lancashire. By his will, made in 1735, Oliver gave his Yorkshire estates to his eldest son Edward, with the remainder to his second and third sons, George and Oliver. On the death of his elder brothers without issue the youngest son, the Rev. Oliver Marton, Vicar of Lancaster, came into possession, but finding the Malhamdale property heavily mortgaged, he conveyed it in 1782 to trustees for sale. The southern portion of the estate, including the manors of Calton, Airton and Hanlith, was sold to Gamaliel Lloyd of Leeds. Retaining Calton Hall and some five hundred acres (Calton Hall farm), Lloyd on the following day conveyed the remaining manors with all the rents, buildings and lands, including Newfield, to William Alcock, Banker, of Skipton, one of the founders of the Craven Bank. In turn his estates were inherited by his eldest son, William Nicholson Alcock, who after a distinguished career at Oxford was called to the Bar at the Middle Temple. He had married Jane Brown, daughter of Thomas Brown of Grassington House in 1817. Leaving the Bar he took a lease of Gisburn Park during the minority of the third Lord Ribblesdale and he can be found living there when the 1851 census was taken. 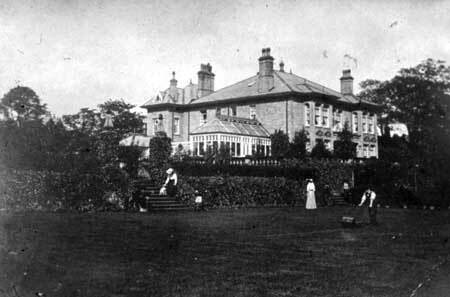 Whilst living at Gisburn Park he built Newfield Hall, costing him approximately £36,000, which then became his permanent home in 1856. 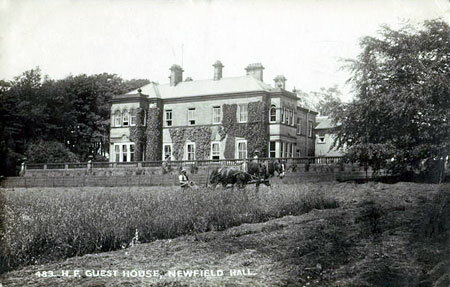 TO BE LET, Furnished for a term of years, all that Commodious Family MANSION, called Newfield Hall, with the gardens, conservatory filled with plant; pits, hothouses filled with choice vines in full bearing: together with the Right of Sporting over the whole estate, and the exclusive Right of Fishing for nearly a mile in the river Aire; and further privilege, if desired, of Shooting over 700 or 800 acres, strictly preserved, at Threshfield and Skyrethorns. The house is situated two miles from Bell Busk station, four from Gargrave, and seven from Skipton, and contains vestibule and noble entrance hall, four large, and well proportioned entertaining and sixteen bed and dressing rooms, and the usual domestic office. The stables consist of two three-stalls, lofty and well-ventilated, together with two harness rooms, and coach house for four carriages. The premises throughout are provided with an excellent supply of water, both hot and cold; the house is in a thorough state of repair, and is healthily situated; the grounds are laid out with great taste; and altogether Newfield Hall is a most desirable family residence.- Tickets to view may be obtained from WILLIAM ALLCOCK, Esq., Henley Grove, Westbury-on-Trym, Bristol. 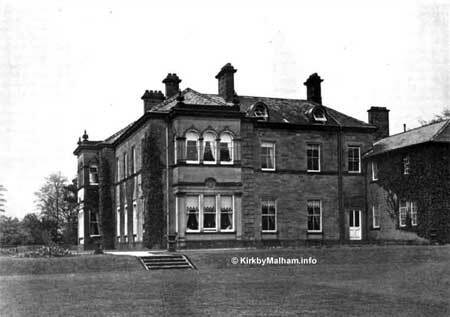 The Hall was uninhabited in 1881 when the census was taken, but in 1890 the Hall, home farm and the rest of the estate, which included the Manor Hotel at Airton, were sold to William Illingworth, a retired worsted manufacturer and member of the Illingworth weaving family of Bradford. The 1891 census shows William Illingworth living there with his wife Christian and son Douglas, but only William is recorded there in the 1901 census. Mr Illingworth was a leader of the local Liberal Party and meetings of the Airton and Gargrave Liberals were held at the Hall in 1892. He offered a site for a new chapel and Sunday school to be built at Airton, which was turned down, the chapel being built after he moved from the area to live in the South of England around 1889. There is a commemorative plaque to his wife Christiana Emma in Airton Wesleyan Chapel. 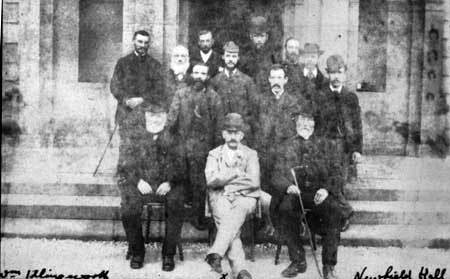 William Illingworth (centre) pictured outside the house, possibly with his tenants. 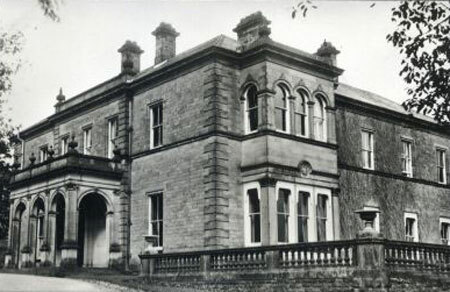 In 1901 the hall was purchased by J W Morkill, who was later to become High Sheriff of the West Riding in 1929. He was interested in heraldry and local history, researching the "The Parish of Kirkby Malhamdale", the definitive local history of Malhamdale. The book was published by his widow shortly after his death in 1933. By the time he died, high death duties and other problems effectively finished off the estate, as it did for many others at the time. By the order of the Trustees of J.W.Morkill (deceased). DEVONSHIRE HOTEL, SKIPTON, on Monday, August 8 at 2.30 p.m.
of good Grazing and Pasture Land, together with the Manors of Calton, Airton and Hanlith, Shooting and Grazing Rights on a further 391 acres, and over a mile of Trout Fishing in the River Are (both banks)- offered first in one lot, and if not sold, then in 19 lots, of which the Mansion, Manors, Park Lands and Plantations (68 acres) will form one lot. The Mansion is of moderate size and has nine principal bed and dressing rooms, seven other bedrooms, two bathrooms, hall, vestibule, kitchens, &c. electric light, central heating. Beautifully situated. On the main line L.M. and S., Leeds one hour, London five hours. Stations: Hellifield 4 miles, Bell Busk 2 miles, Skipton 8 miles. Full particulars, plans, and conditions of sale may be obtained from the Auctioneers; or from Mr J.W. BROUGHTON, land agent and surveyor, Skipton; or Messrs. WHITTINGTON & TALBOT, solicitors, 34, Albion Street, Leeds. The estate failed to find a single buyer and was split up, with some farms sold off to tenants, the Hall leased to the Holiday Fellowship and what remained of the estate was sold off to All Souls College, Oxford. The hall was badly damaged by fire when being refurbished in 1998 and after restoration the house is now run as a Country House hotel by HF Holidays who specialise in walking holidays. See their website for images of the house today and details of the accommodation.